How do you say sorry for sending someone to war? Wellington College’s Headmaster, J.P. Firth, encouraged all students and Old Boys to do their bit for the war effort, and for hundreds of Old Boys, that meant enlisting to serve overseas. Imagine how he felt when so many of them were killed and wounded. Firth was known as ‘The Boss’. He cared a lot about the school and the students; often writing personal postcards to the Old Boys serving overseas, keeping them up to date with school events. It was a huge blow to Firth every time he heard of an Old Boys’ death. He wrote personal letters of condolence to the families of the 222 Old Boys that were killed. On the day of the Armistice, he stood on the school steps, tears running down his face as he perhaps struggled with the guilt of encouraging so many to enlist. Fred McKee’s family had three sons enlist in the army, but Fred was the only one who didn’t come home. Firth remembered him as a young boy at school. He had seen him grow up, so it would have been incredibly hard to write to a family who had just lost their son. They were not just 222 names to Firth, they were 222 lives. 222 former schoolboys, each with a unique story of their own and a family who loved them. You have been given the letter sent to Fred's father in Motueka by J P Firth, the Headmaster of Wellington College. J P Firth wrote one of these condolence letters to the parents of every Wellington College Old Boy killed in the First World War. You are now tasked with discovering more of the story behind Frederick George McKee and his old Headmaster J P Firth. How much of his story can you piece together? The suggestions below will help you on your research journey. The When We Search Fact Sheet will also be a helpful tool in helping you discover the pieces of Fred and Firth's puzzle. You're in luck. 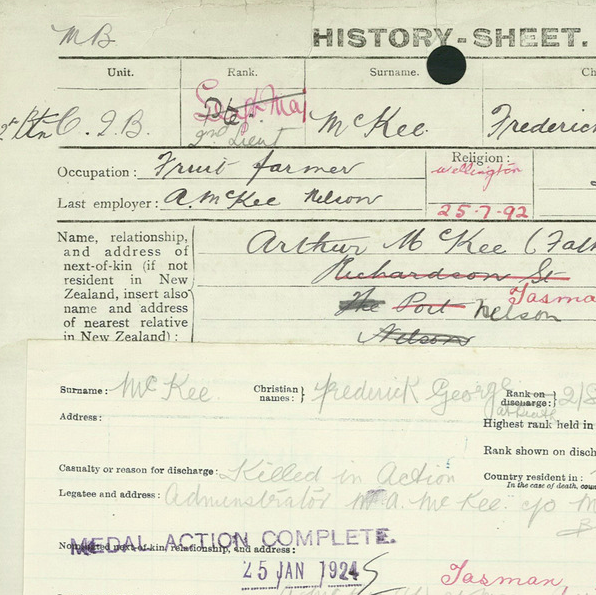 Fred served in the New Zealand Army so his records can be found online at the Auckland War Memorial Museum Cenotaph. This is your most important search. Collect as much information as you can. Once you've found Fred's Serial Number move to Archway and search for his service documents there. WHY IS J P FIRTH PART OF THIS STORY? J P Firth was the loved Headmaster of Wellington College. He encouraged hundreds of Old Boys to go to war and more than 1600 enlisted. His former students wrote to him from the Front and he wrote back. 222 Wellington College Old Boys were killed and Firth wrote to every parent in sympathy. Use DigitalNZ and Timeframes to find pictures of Wellington College and J P Firth at this time. Fred was a boarder at Wellington College. The McKee Family were from Motueka and his History Sheet in his soldier record showed that the family was on the move in Nelson. Fred is remembered at Tasman School in the above Roll of Honour. Can you find Fred amongst the Nelson Museum's tribute to local soldiers? Use Google to find out one more special Tasman location in Fred's name. Discover more pieces of Fred and Firth's story. what was the soldier's tobacco fund? In August 1915 Fred McKee wrote to the Nelson Evening Mail thanking the Nelson public for his free cigarettes and tobacco. Each 6d donated to the Soldiers' Tobacco Fund by school children and Nelson locals purchased 2ozs. of tobacco and 30 cigarettes. Any soldier in any regiment could be chosen and the tobacco and cigarettes were sent direct to him. Use Papers Past to search for "tobacco fund" in 1915. How much was raised? How many cigarettes would that have purchased? Use the What We Ate Fact Sheet to understand the impact of smoking on soldiers. In 1915 the Nelson Evening Mail published a letter that Fred had written home to his father Arthur. The letter is written while Fred is still in Egypt and before he goes to the Dardanelles to fight on the Gallipoli Peninsula. In it he describes some of the earliest fighting that troops were involved in and talks about the death of William Ham. Who was William Ham and why would his death have been especially important to Fred and his Motueka friends? HOW DID WELLINGTON COLLEGE PREPARE THEIR STUDENTS FOR WAR? In 1900 The Defence Act made military training compulsory for nearly all boys from the year they turned 12. The programme was called School Cadets and involved drills, twice a week on school grounds wearing uniforms and carrying dummy rifles. Use DigitalNZ to find images of school cadets and of the Wellington College School Cadets. Many men list their school cadets on their attestation form as military training. DID writing all those letters to parents change how j p firth felt about the war? Read this speech that J P Firth gave about the war in 1915. This article uncovers some clues about J P Firth after the war - from his tears as the Armistice was announced, to his insistence on the location of the Wellington Cenotaph (he would die two weeks before it was unveiled). We can never know for sure but how do you think Firth's had changed from his 1915 speech? The Headmaster's sympathy letter is connected with the story of Frederick George (Fred) Mckee who attended Tasman School, Motueka District High School and Wellington College. The original letter is held by Wellington College Archives. It is this project's understanding that Frederick has no surviving relatives. McKee Memorial Reserve - In Memory of Fred. The Walking with an Anzac Team found the first clue in Fred's story when they visited the archives at Wellington College. The school has a stunning memorial window acting as a constant reminder of those who fell. Further research on the same platforms you have used today allowed us to discover Fred's Story. Frederick's handwritten Service Records can be found on Archway here.